If your girl wants to dress up as one of the famous Disney leading ladies, there's no better place to shop than right here! 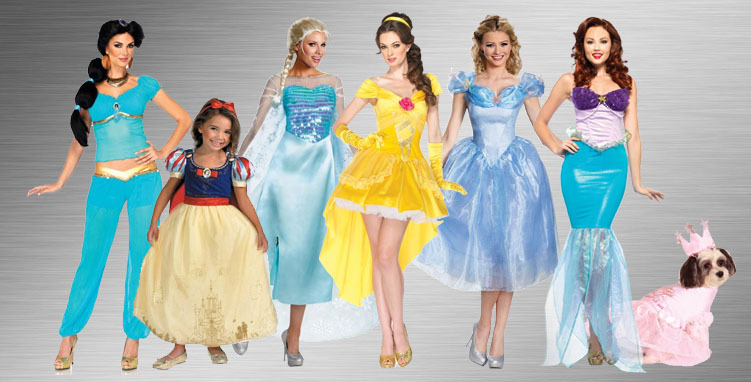 This collection of Disney Princess Costumes include characters like Rapunzel, Aurora, Elsa, Ariel, Jasmine, and lots more! There are also great accessories to help any Halloween costume look great, like tiaras, wands, shoes, gloves, and lots more. There are even outfits for adults! We already know you’re a beautiful princess, the only thing missing is a sparkly dress and pretty tiara. Let the Disney magic sweep you off your feet as you become one of your favorite leading ladies. You don’t even need a fairy godmother! Build a snow man with Elsa and Anna, let down your hair from the tower as Rapunzel, or hang out under the sea as Ariel. 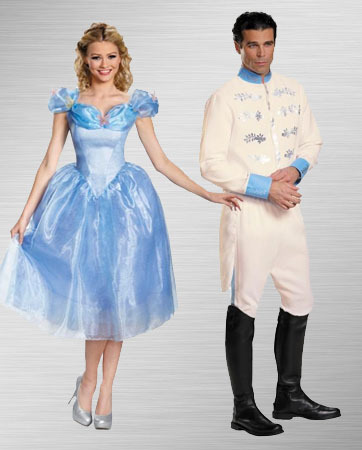 Girls of all ages will feel like true royalty with these delightful Disney Princess costumes. Escape to another time and place as you become the Belle of the ball at your next costume party. Don’t worry though, a handsome prince is optional. These beautiful Disney Princess costumes are sure to help you feel your best no matter the costume occasion. Enchant your friends and family by showing off your true princess self. Aurora delights those around her with her beautiful singing voice. When cast under Maleficent's jealous curse, she falls into a deep sleep. With the help of Prince Phillip and the three fairies, the spell is broken and she awakes from her slumber to see her dreams come to life. Eager to grow up and see the world, Ariel wants to experience life beyond the sea. Love-struck by Prince Eric, Ariel takes a risk for true love that almost goes wrong. With the help of her friends and the prince, Ariel finds her happily ever after. A bookworm who loves to learn, Belle has an amazing imagination and vocabulary. Don’t tell this confident and outspoken girl what to do. With beauty and brains, Belle stands up for her beliefs every step of the way. Cinderella is a confident and independent young woman. She remains kindhearted no matter how much evil or sorrow is thrown her way. Brave, intelligent and resourceful, she finds her way to the ball. Cinderella shows that kindness pays off as she lives out her happy ending with Prince Charming. Along with her Snow Queen power, Elsa shows a warm and loving heart. She becomes a free spirit without losing her sense of elegance. She is truly devoted to her sister Anna and the land of Arendelle. Jasmine isn't afraid to speak her mind to stand up for what's right. She is a compassionate and caring princess of action. Jasmine spreads love for her kingdom far and wide as she swoops around on a magic carpet ride. An adventurous and daring princess, Rapunzel lets down her hair to discover the world outside her tower. When a situation calls for bravery, she's up to the task. And don't even think about challenging her baking and crafting skills. A romantic dreamer, Snow White is the sweetest and most gentle Disney Princess. Singing, dancing and cooking are her specialties. She cares deeply for others and shows compassion in her bond with the seven dwarfs. Get a group together to embark on a journey to save the kingdom as your favorite Disney princesses. Your little princesses will make a splash at any costume party or event. Rapunzel and Mulan bravely fight for a better life. Book-smart Belle shows off her knowledge when she stands up for her beliefs. 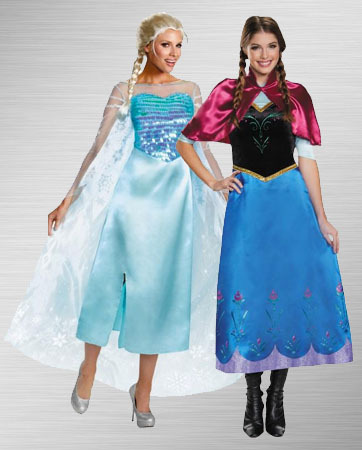 Your queen in training will love dressing up as Elsa the Snow Queen to protect the kingdom. Show your little ones the value of hard work with Tiana’s determination to achieve her dreams. 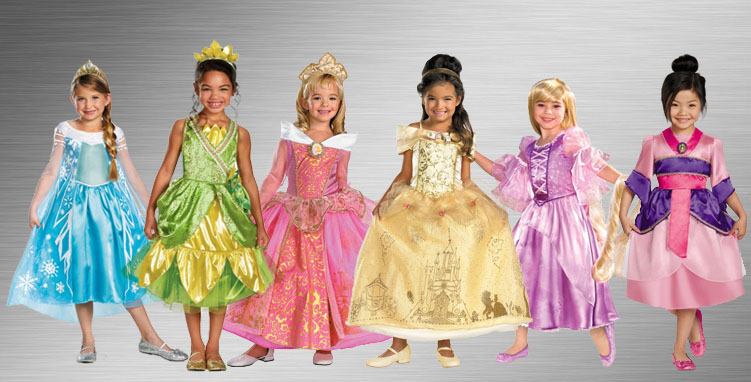 Whichever princess costume you choose is bound to bring a magic Disney sparkle to your daughter’s eye. No need for a handsome prince when you can be one of the cool, confident Disney leading ladies. Do you want to build a snow man? Save the day in Arendelle as one of the lovely Frozen sisters. Whether you've got Anna's curiosity or Elsa's loyalty and leadership, show off your beauty as this dynamic duo. Prince Charming rejoices after finding the owner of the mystery glass slipper. Dress up as this timeless couple for an elegant evening at the ball. A classic couple's costume winner, Cinderella and Prince Charming steal the show. You might wish you could cast a sleeping spell on your baby, but we promise these are only costumes. 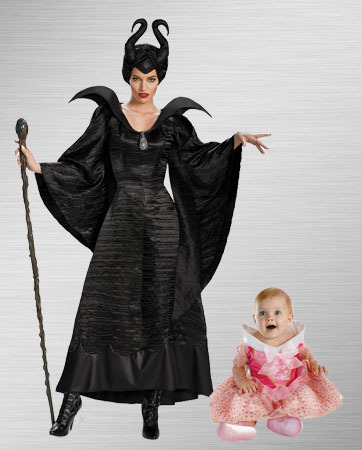 Hold your very own Sleeping Beauty in your arms as you turn heads as the evil Maleficent. C'mon, we know your pup loves to join in and sing along to your favorite Disney princess tunes. Why not let them dress the part? 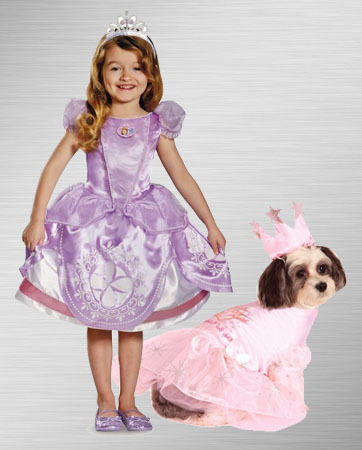 Include them in your royal family with these entertaining Glinda canine costumes. 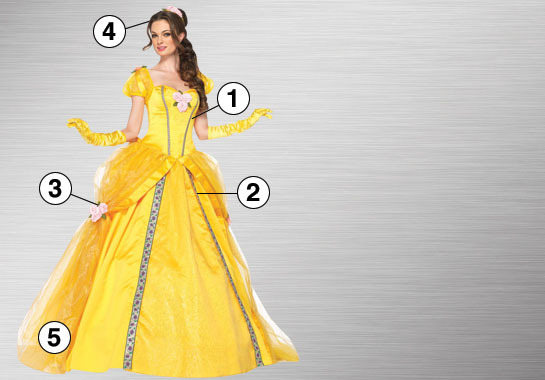 You're the star of the fairy tale when you dress in the ultimate Disney Princess Belle costume. Escape to a land of sword fights and magic spells when you dress as this smart and confident princess. Venice lace applique makes this outfit glamorous enough to take on the fanciest of royal balls. Embroidered ribbon trim and glitter tulle panniers complete the look so people will truly believe in your princess powers. Discover your disguised prince in soft pink floral accents and a matching floral headpiece. This costume is officially licensed by Disney. Mirror, mirror on the wall you're the fairest of them all! Your little queen in training will love playing dress-up as one of the most beautiful and timeless princesses in the group. Be careful though, the seven dwarfs may just show up in your house. Don't leave out any details when creating the ultimate Disney Princess experience. 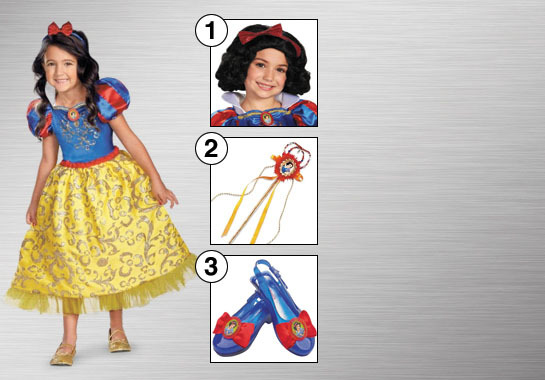 Your princess will need Snow White's pretty black locks, princess wand, and sparkle shoes to look the part. She already sparkles and shines in your eyes, so let her be a part of her favorite fairy tale stories. Truly transform your mini princess into Anna from Frozen with this makeup tutorial. You have the outfit complete, the only thing missing is a little blush and eyeshadow. This tutorial features Anna of Arendelle's natural look for that genuine princess appearance.